specific chimes of such a machine. 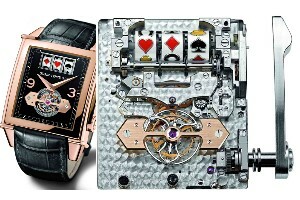 The clock mechanism is of a completely new design and modified so that the slot machine will also fit inside the case. At 6 o’clock there’s a cut-out that reveals the Tourbillon, behind its gold bridge. A glass window on top reveals the 3 gold reels, with carved suits of spades, hearts, diamonds, horseshoes and the jackpot-granting bells. Pulling the handle will start the spinning of the reels. The stoppers are connected to a striking mechanism, so that chimes are heard every time a reel stops. The few which will afford to buy this limited-edition watch will surely enjoy this very strong contrast of the precision of Swiss watches and the randomness of a slot machine and it’s another gadget approved by nerds.